Home / athletes / benefits of coffee / coffee / fat loss / performance / weight loss / Using Coffee for Daily Fat Loss! Using Coffee for Daily Fat Loss! 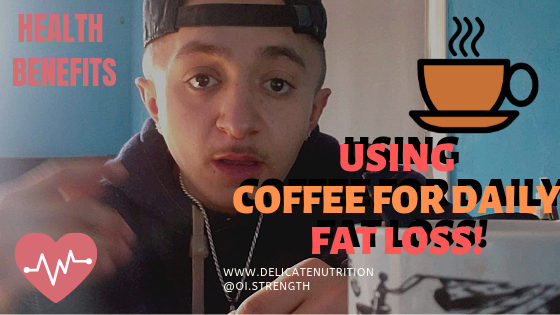 Using Coffee or Daily Fat Loss! As some of you may know, Coffee benefits us Humans in so many ways! 1) Stimulates The Brain - If you're low on energy, need to focus and need high performance, consider coffee. Coffee is a stimulant, containing caffeine which produces energy and increases performance drive. Caffeine is regularly consumed for breakfast or for energy, but it also helps Athletes out and has other health benefits! 2) Appetite Suppressant - Everyone should know this by know. Coffee or caffeine can be used as an appetite suppressant. This helps curb your appetite for food. This is useful to stop eating, restricting calories, etc. A couple of cups a coffee a day won't hurt! 4) Mood Booster - I find that Coffee helps with depression and overall improves mood. Whenever I'm feeling anxious or depressed, a cup of joe relieves the negative emotions, somehow. The theory of how that works is possibly due to the Caffeine within Coffee, stimulating parts of your brain which alleviates the depression state. 5) Improve Health - Coffee has been found to help with inflammation and pain. Coffee contains a lot of good antioxidants which helps fight off disorders/diseases and inflammation. *A typical serving of coffee contains more antioxidants than typical servings of grape juice, blueberries, raspberries, and oranges. I love drinking coffee in the morning. It gets my day started. I use coffee for it's benefits, and I may possibly be addicted to caffeine now...Anyways, the purpose of me using coffee is to alleviate depression, improve mood and athletic performance. I am a bodybuilder, so caffeine is a must for me. I get a crazy energy shift when I consume caffeine. However, being addicted or consuming too much caffeine can lead to many problems. Never be hooked on caffeine and if you are, take a break. I noticed that whenever I consume caffeine for a long period of time, I start to feel the opposite at times. Feeling shaky all the time, nervous, dependant on caffeine, and experiencing other mental issues. By reducing the intake or completely going cold for some time to recover will put you back on track. The trick is, don't depend on caffeine nor consume in excessive amounts - moderately consume caffeine! -- Previous Article: Don't make these Mistakes When Dieting! I drink coffee in the morning, hardly any creamer in there, still a bit bitter but overall very low on calories. Coffee is an appetite suppressant, so I fast every day til 12-2PM. I'm burning calories within my fasting time. I'll drink coffee throughout the day if I ate a lot beforehand, normally a day before to help reset my body, my metabolism and getting everything going again. And I use coffee as a diuretic, helps with losing water weight to look more shredded. Black coffee is preferred because it contains literally no calories, but be in control of your creamer/sugar/sweatner/etc. ⧭What's your Opinion on Coffee and Weight Loss? Do you Find it Beneficial or a waste?